These beautiful little (10”) birds are found in the desert valleys of our Southwest. Each bird has a teardrop crest with the hen’s being shorter. Both sexes are brownish in color and the males are distinguished by black abdominal marking and black necks. Good layers of up to 2 dozen eggs and good parents. 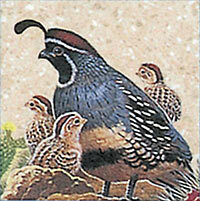 Can be put with other quail after arrival. Limited Supply. Shipped in June only and sold in lots of 100. For safe delivery, your order must total 100 or more birds. We can't mix the different breeds of quail to make 100. Before buying, please check with the Regulatory Agency in your state that controls wildlife management. You may need a permit. You would need to check with the Regulatory Agency in your state that controls wildlife management. No, we are not able to ship the quail to Canada.